The first chakra (root) is located at the base of the spine, the seventh chakra or crown chakra is located on the top of your head. The remaining chakras, (sacral, solar plexus, heart, throat, and third eye), are aligned in sequence along the spine. Individually, your chakras look similar to funnels with petal-like openings. Chakras are invisible to the human eye, but they can be perceived intuitively by trained energy workers, clairvoyants, and psychics. The word “chakra” is derived from a Sanskrit word that literally translates as “wheel.” If we were able to see the chakras (as many clairvoyants, in fact, do), we would observe a wheel of energy continuously revolving or rotating in a clockwise direction. Although fixed in the central spinal column, they are located on both the front and back of the body and work through it. Chakras emulate a flower as each chakra has a different number of petals that look like rotating tubes filled with different colors of energy. Swirls of energies arise from each chakra connecting into the aura or energy body. Each chakra vibrates or rotates at a different speed. The Root or 1st chakra rotates at the slowest speed, the Crown or 7th chakra at the highest speed. Chakras are stimulated by colors, the colors vary by wavelength and frequency and range from bright, translucent colors at the higher end of the spectrum to darker shades of gray, brown, and black at the lower end of the spectrum. The size of the chakra wheels differs according to individual development, physical condition, energy levels, and lifestyle of each individual. 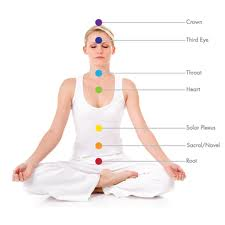 The health of our chakras affects our physical, emotional, mental, and spiritual health. When the chakras are not balanced, or when the flow of energy through the body is blocked or slowed at one chakra point or another, the basic life force within us slows down. As a result we may feel tired, anxious, unmotivated, or depressed. Over time, if this universal energy is not allowed to flow properly through us, we may develop a physical or mental disease requiring medical attention. Most of us react to bad life experiences by closing ourselves and blocking our feelings. This literally reduces a great deal of our natural energy flow. This affects the healthy, maturation and development of the chakras. Whenever we block a painful experience, we are in turn blocking our chakras, which eventually become disfigured, discolored, and drained of energy. It is important to note, too, that if our chakras are way too open, we could literally short circuit ourselves with too much universal energy going through our bodies! When the chakras are functioning well, however, each will be open and spinning clockwise to metabolize the particular energies needed from the universal energy field. Cleansing and balancing the chakras brings us vitality and newfound energy. When our chakras are healthy and balanced, our lives are filled with joy, happiness, and purpose.